Iman Nanji is Director of the Helena Fellowship Program at Helena, a Los Angeles based think-tank. 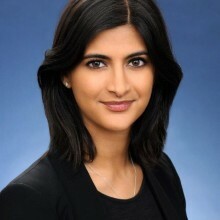 Previously, Iman was a Senior Associate of Business and Program Development at the Milken Institute where she fostered strategic partnerships and developed programs to engage the Institute’s top supporters from around the world, including financial institutions, multinational corporations, foundations, and philanthropists. Iman oversaw the growth of such programs as the Milken Institute Associates and the Young Leaders Circle, powerful groups of global leaders representing a broad range of industries. Iman began her career as an investment analyst on a multi-asset class trading desk at J.P. Morgan, where she provided advisory and brokerage services to clients. Iman graduated from Columbia University with a bachelor of arts in Middle Eastern, South Asian and African Studies and is pursuing a Masters in Public Policy at the Luskin School of Public Affairs at UCLA. Iman serves on the Young Professionals Board of KIPP LA Schools.